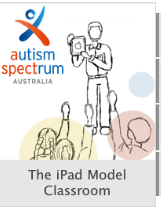 The iPad Model Classroom is an iTunes U course which contains a plethora of interesting resources to help teachers leverage the educational potential of iPad to enhance autistic students’ learning. These resources include specially curated lists of apps for students with special needs, Interactive books, videos and many other materials related to the integration of iPad in the classroom for kids with autism.While some of these resources are free the majority are not. The collection contains over a hundred items. You may want to go through them and see what you want to use in your class. If you haven’t already seen it, below is a chart we have created and shared a few weeks ago comprising some of the best apps for students with special needs. Check them out and share with us your feedback.